Lightweight champion Anthony Pettis wanted to stay busy in 2015 and it appears he’ll get his wish as he faces Rafael dos Anjos in the newly announced main event for UFC 183 taking place March 14 from the American Airlines Arena in Dallas, TX. The announcement was made during the UFC 182 prelims airing on FOX Sports 1. Pettis (18-2) missed most of 2014 due to a knee injury as well as filming the latest season of The Ultimate Fighter. In his return to action, Pettis submitted Gilbert Melendez to make the first successful title defense since winning the belt in 2013. Now the fighter UFC president Dana White believes could one day be a top pound-for-pound great will make his second defense against a very dangerous Brazilian competitor. Dos Anjos (23-7) gets his first crack at a UFC title following a seven year career with the promotion including a rapid rise up the rankings in his past nine fights. Most recently, dos Anjos dismantled former title contender Nate Diaz at the UFC Fight Night on FOX card in December to officially move into the top contender spot. 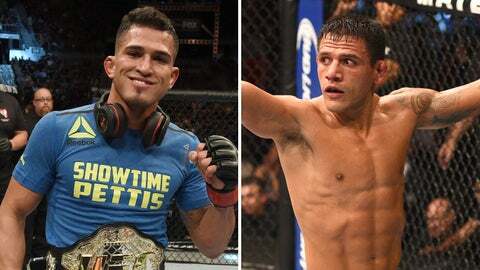 Pettis vs. dos Anjos will headline UFC 185 from Dallas as the UFC embarks on another big show during the first quarter of 2014. Stay tuned for more fight announcements in the coming weeks.